In the earliest times in Sweden, every person had just one name, the "given" or Christian name. But with the advent of record keeping, it became necessary to distinguish between different persons with the same name. In Sweden, as in most countries, this was initially done by identifying the individual's father. The father's name was placed after the given name, and a suffixed -son or -dotter was added, along with an extra s to indicate the possessive case. For example, the earliest known Gyllenhaal ancestors are Olof and his son Gunne, who is referred to in records as Gunne Olofsson. (Figure 1) This "patronymic" system of naming was the rule in rural Sweden until around 1860, when it became more fashionable for families to adopt a permanent family surname. Nevertheless, the system was still used in some parts of Sweden well into this century. Figure 1. Gunne Olofsson is the first individual known to have used Haal as a surname. His son, Nils Gunnesson Haal, was ennobled Gyllenhaal by Queen Christina in 1652. There is an obvious disadvantage to the patronymic system: it was common to end up with several persons having the same patronymic surname in the same area (especially when, as in Sweden, the number of "given" names used was very limited). Therefore non-patronymic surnames began to appear in Sweden after the Middle Ages, and by the 17th century they had become especially common among the nobility, the clergy, members of guilds, university students and the military. This gradual trend toward the use of surnames in Sweden explains the appearance of Gunne Olofsson's name as Gunne Hall in the Landed Property List (Jordebok) of 1631. (Standardized spelling being a modern invention, Gunne's surname also appears as Hahl and Haal.) His son, Nils Gunnesson Haal, also inherited this name. This would later become the haal in Gyllenhaal, but while the origin and meaning of the prefix gyllen- is quite clear, the origin and meaning of haal is not completely certain. Haal as a surname was almost non-existent in 17th century Sweden, and even before that time. And it seems natural to assume some connection between the surname Hall/Haal/Hahl and Hahlegården, the name of the Crown Homestead in the parish of Södra Härene in Västergötland on which Gunne's family lived and perhaps worked. (Figure 2) So there are two possible explanations for the origin of Haal, which first appears in connection with Gunne Olofsson: 1) Haal was an "individualizing byname" given to Gunne or one of his ancestors, and Hahlegården was named after one of these people, or 2) Haal was a surname adopted from Hahlegården (also called Haragården), the previously established name of the family's farmstead. Figure 2. The province of Västergötland in Sweden. The arrow indicates the location of Södra Härene, the parish where the Gyllenhaal family originated. As for the first possibility, it could be the case that Haal was an "individualizing byname" given to Gunne or one of his ancestors, by chance or by whim. Bynames were common in Sweden at this time as a way of distinguishing between individuals holding the same "given" name. (Bynames could sometimes be inherited from the father, although they should not be regarded as true surnames.) If this is the case with Hahl, then Hahlegården, the farm on which the family lived, may have been named after Gunne or one of his ancestors, and may simply have meant "Hahl's farm." Hall/Hahl/Haal could derive from hall, a word meaning "rock formation." "Nature names" of one or two syllables which incorporated the vocabulary of the local countryside were common in Sweden and Finland (but not in other parts of Scandinavia). There is a steep, rocky hillock in Södra Härene, as well as stone-bound pastures-terrain which could lend support to this interpretation. Hall/Hahl/Haal could derive from hara. This could mean "hare" or "rabbit," and in fact other families have held the name Hara and used the image of the animal in their coats of arms. Hall/Hahl/Haal could derive from the word hård, meaning "hard." Hård is attested as a soldier's name as early as 1545. Soldiers' names often referred to a characteristic that the soldier was supposed to possess, and so Hård may have meant "tough," in the sense of being invulnerable to weapons. Hård was not an unusual name, and in fact Leonard Gyllenhaal married a certain Anna Hård in 1788. However, Haal is not very likely to have evolved from hård, since one would expect the å-vowel to appear instead of aa in 17th century Västergötland. Hall/Hahl/Haal could derive from hal meaning "slippery," "smooth" (or perhaps by extension "sleek" or "smoothtongued"). The circumstances giving rise to such a byname would probably have been forgotten over the course of a few generations, but the name would no doubt have related to some personal characteristic of the person in question. Hall/Hahl/Haal could derive from hin håle, meaning "the Devil," i.e. the Hard One. The reason for such a byname must be obscure, but would, like hal above, have relation to some characteristic of the person. Many other strange bynames are known for soldiers, such as Drivare (Drifter), Dobblare (Gambler) and Kåhlhufvud (Cabbage Head)! Sometimes bynames like these were dropped by the soldiers themselves when they left military service, or were not taken up by their children. Of the possibilities listed above, some are more likely than others. Even if it could somehow be determined that Haal was originally a byname, its origin and meaning are lost to time. However, it seems more likely that Haal was not an individualizing byname at all, but a surname adopted by Gunne or one of his ancestors from the name of the family homestead Haragården/Hahlegården. In other words, the farm itself may have earned the name Hall/Hahl/Haal, and then been taken over as the family's surname at a later date. In fact, it seems likely that the hara in Haragården stems from the ancient name of the parish where the farm was located. Gunne Olofsson is said to have lived at the Crown Homestead of Stomgården in the parish of Härene, that is, Härene Stom. (Figure 3) In early Sweden, the Stomgården ("Stem-farm") was often the central farm in a locality around which the others were grouped. It was also the state-owned farm where the church stood, and was normally farmed for the upkeep of the parish priest. Figure 3. Map scale: 1 square = 1 km. The parish of Södra Härene is located 50-km southwest of Skara. The original stone church, now in ruins, is indicated in outline (see arrow). Nils Gunnesson Gyllenhaal and his wife Märta were buried in the church cemetery. It seems, then, that the Stomgården of Härene parish received its name from the parish itself, and the ancestors of the Gyllenhaals were later named after the farm on which they lived and perhaps worked. As for the meaning of Härene, the ancient name of the parish which goes back to at least the 14th century, it has been suggested that it means "bedrock," "stony ground," or the like, or even the animal "hare." It may prove impossible to conclusively determine the origin and meaning of the haal in Gyllenhaal. Further research into local traditions for naming people and farms might clarify the matter somewhat. In the 17th century, the most common prefix for ennobled soldiers was the adjective gyllen-, meaning "golden." This prefix could either be appended to the soldier's original name, or combined with another word describing some attribute deemed desirable for a warrior. For example, in 1665 a certain Jonas Månsson was ennobled Gyllenhammar, i.e. "Golden Hammer." (One of his descendants, Pehr G. Gyllenhammar, was until recently executive chairman of Volvo.) Among the officers of Charles XII there were not only nine Gyllenhaals (all descendants of Nils), but many other officers with names like Gyllengrip, Gyllengranat, Gyllenflycht, Gyllenfalck and Gyllenpamp. And a total of seventy-five surnames beginning with the prefix gyllen- are listed in Gustaf Elgenstierna's standard reference work on Swedish noble families, Den Introducerade Svenska Adelns Ättartavlor. *The "Haal" in Gyllenhaal was not spelled consistently in the early days. In the Knighthood Letter of Nils Gunnesson Gyllenhaal (dated 1672) it appears as both Gyllenhaal and Gyllenhahl. On the family coat of arms hanging in the Great Hall of the House of Nobles (likewise probably made in 1672) it is spelled Gyllenhahl. The name was still being spelled variously in the 18th century in the time of Leonard Gyllenhaal (1752-1840), who spelled it Gyllenhaal, Gyllenhahl, and even Gyllenhal. Today, however, the name is always spelled Gyllenhaal on both sides of the Atlantic. **The name Hahlegården is no longer known in the area and does not appear on modern maps. However, in the late 1920’s Lars Herman Gyllenhaal (d. 1957) and his nine-year-old son visited the area around Södra Härene. Their host, whose name was Andersson, said that in his youth (he was about 60 in 1927) the name Haragården was still known but was not used. During their visit, the site of old Hahlegården was understood to be to the east of the church ruins, just across the road (see Figure 2). 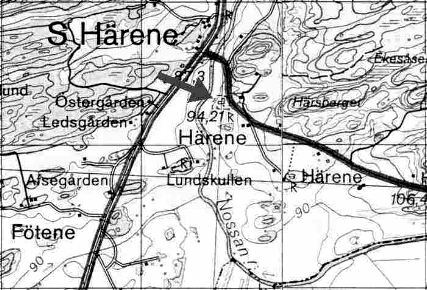 Lars Herman’s records say that the village of Härene was broken up in 1872 in order to improve agricultural production in the area. For more on the location of Hahlegården see the article on Nils Gunnesson Gyllenhaal.